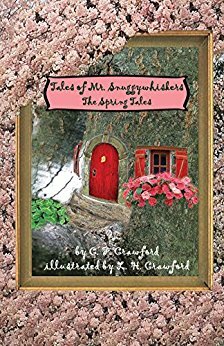 Tales of Mr. Snuggywhiskers, The Spring Tales, by C.F. Crawford, is the continuation of the story of Hallie and Cory, sisters who have befriended a family of mice living in a tree in their backyard. But these are no ordinary mice. Mr. Snuggywhiskers and his family can speak, and Hallie and Cory are able to magically shrink to mice-sized proportions whenever they want to visit the Snuggywhiskers’ family home. In The Spring Tales, the third book in the Tales of Mr. Snuggywhiskers children’s book series, Cory and Hallie go on a trip, taking the Snuggywhiskers family along with them. The girls discover there’s more to Mr. Snuggywhiskers past than they’d realized. But learning the truth proves to be more challenging than they ever could have imagined. Author C.F. Crawford continues to deliver in her most recent addition to the Tales of Mr. Snuggywhiskers series. The Spring Tales is entertaining and full of delightfully imaginative scenarios which are sure to keep young readers enthralled. Full of whimsical adventure and a hint of mystery, this book is recommended for home and school libraries.